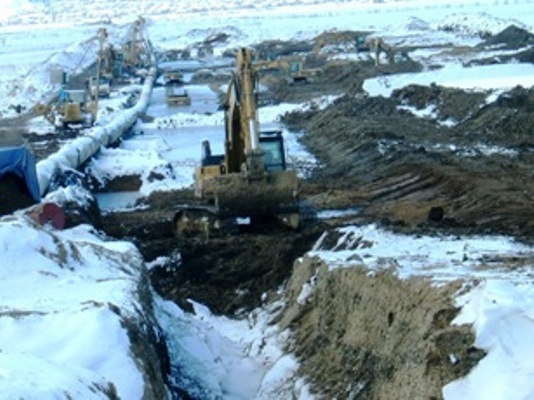 This section presents an insight into pipeline construction and the environmental and social effects, giving examples of good and bad practice. Additional detail in the form of training modules can be provided in person or on CD disc. Please contact andrew@huckbody.com for further information. Drains are installed on the upper side of the ROW to divert water that would otherwise make construction difficult. 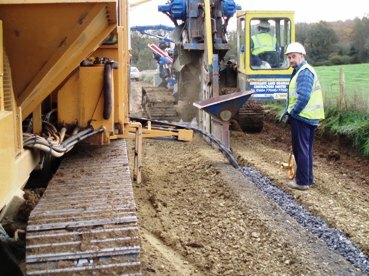 In the UK, trenches are often dug and drainage pipes buried, often with a drainage machine. 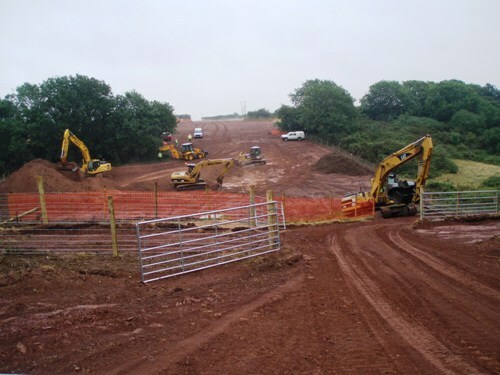 This operation can conflict with wetland habitats and countryside stewardship schemes, especially as Agricultural Liaison Officers (ALOs) often make agreements with land owners to retain these formal drains and there is a reluctance to remove them following construction. In valuable wetland habitats it is often preferable to construct cut-off open drains/ditches, which can then be filled in later to avoid damaging the wetlands. 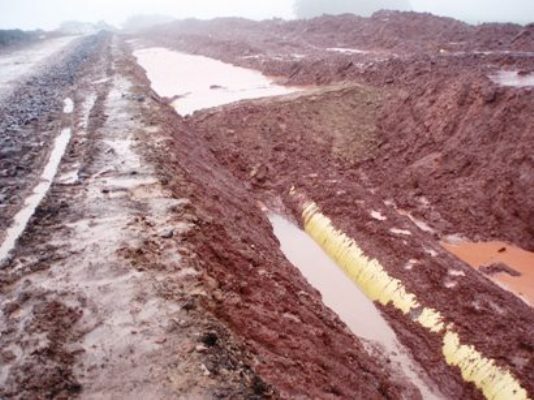 Another important issue is post construction drainage, with conflict arising between maintaining a dry trench and policies of not improving agricultural drainage and therefore damaging wetland habitats. 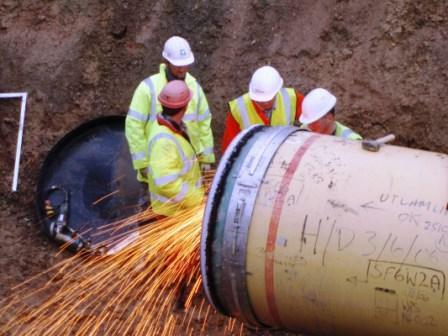 The issue of drainage can be quite complicated and further guidance can be provided as part of training courses from HEL; email huckbody@huckbody.com/ for details. Best practice includes full compliance to project procedures established in documents like the environmental statement/reports and local and national legislation. 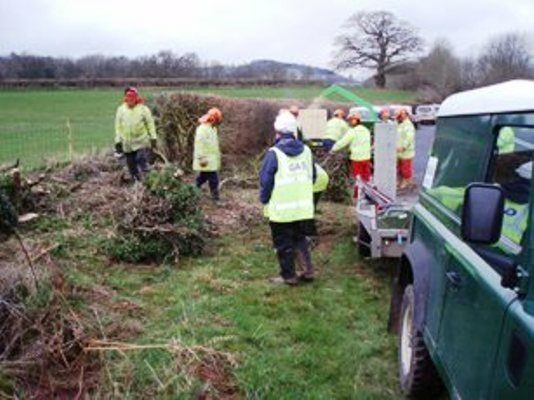 Aspects could include translocation of valuable herbs or woody vegetation such as hazel coppice; these could be permanently relocated or temporarily translocated for return to the ROW following reinstatement. In woodlands, many projects specify clearance and off-site removal of trees and shrubs combined with shredding of brash (twigs and branches). 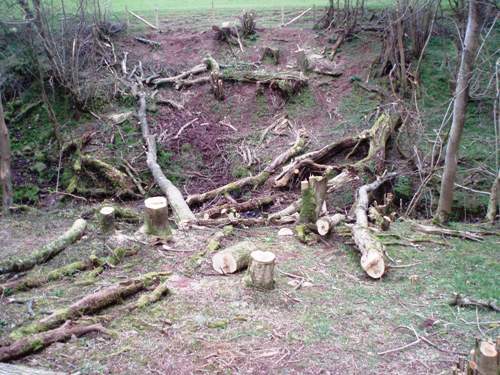 However, for valuable wildlife woodlands, off site removal of woody vegetation removes biomass, which can affect the ecological/conservation value following reinstatement. For valuable sites it is invariably preferable to return logs and tree stumps, either in ‘log/habitat’ piles or distributed through the site. The only real exceptions should be where tree diseases are prevalent and/or the landowner has specific requirements. 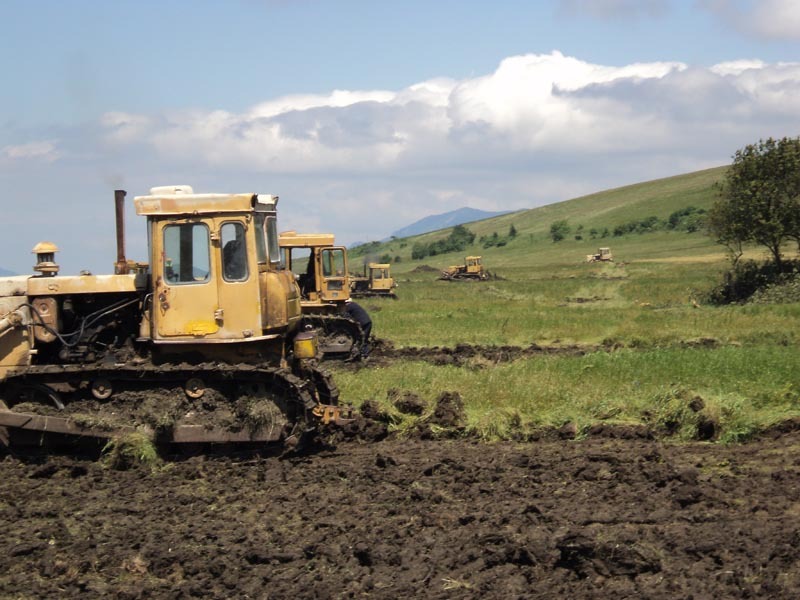 Certain valuable grassland sites can have turves of the most rich or diverse areas taken off and stored for final return during reinstatement. Some professionals have recently started to specify so-called double stripping, whereby the uppermost layer of the topsoil is removed separately from the lower topsoil (down to a typical total of 300mm), with the intention of taking off the seed bank. 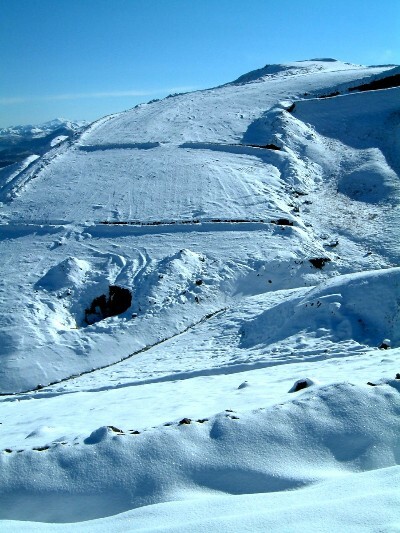 However, it is recommended to carefully consider a case-by-case basis, as the seed bank layer will inevitably be of small volume and will be very exposed to weathering, wash down and desiccation (especially in semi-arid lands) and losses of this could result in a significant loss of the seed bank, therefore rendering the practice more damaging than having the overall seed bank distributed within the typically 300mm topsoil layer often stripped off. Factors to consider include climate, weather and habitat type. An additional factor to consider is topography and the reinstatement machinery to be used, as most bulldozers cut levels to around 100mm, thus there is a possibility of patchy re-distribution of the relatively thin seed bearing topsoil. Coppicing trees in a protected site prior to construction across a river valley. 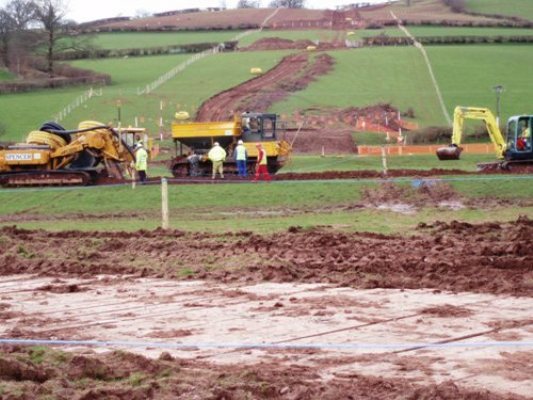 For most soils a 300mm layer is typically specified to be removed prior to subsoil grading. 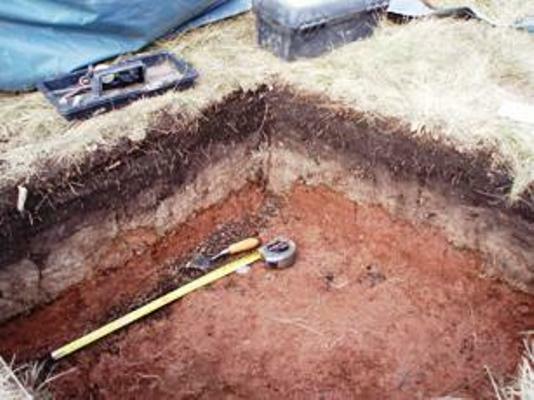 The depths and techniques vary in accordance with the type of soil or ground conditions. 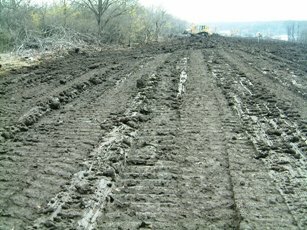 For wet, peaty soils varying layers can be removed, depending on ground bearing capacity and other factors. 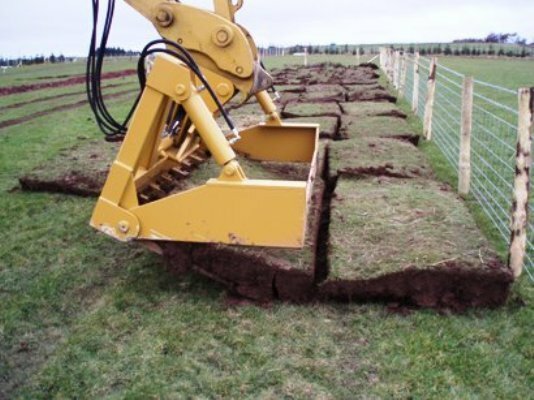 Peaty soils are often stripped off using back hoes/360’s, rather than bulldozers. 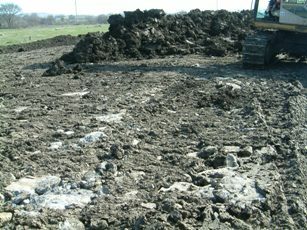 Within the industry there is increasing debate about the height of topsoil mounds and the length of time they remain in storage prior to reinstatement. The principle is that for diverse grasslands, the longer the soil remains in storage and the higher it is stacked, the more seed bank deterioration occurs. However, there are many factors involved in this, including the amount of surface water building up against the mound, the amount of rainfall impregnation of the mound and the soil type and its drainage properties. In short, there tends to be an industry standard of ca. 1.5m height and there are opportunities for topsoil management to retain or replace seed bank diversity. 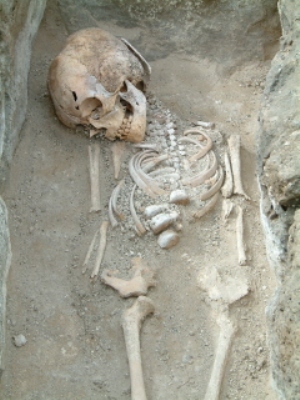 These are often a key part of the pre-construction studies and can lead to interesting finds during construction, as these Bronze Age burials from the Caucus Mountains show in the photos. 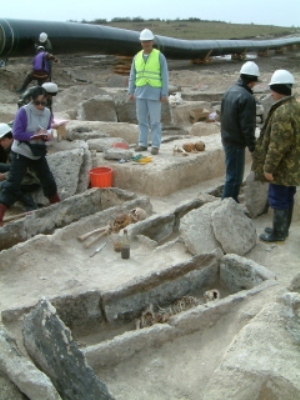 Thesedays pipelines can involve considerable investigations, such as trial pits to inform minor route changes and controlled stripping, which is similar to the watching brief undertaken by archaeologists, but can be more onerous on stripping and trenching methods. 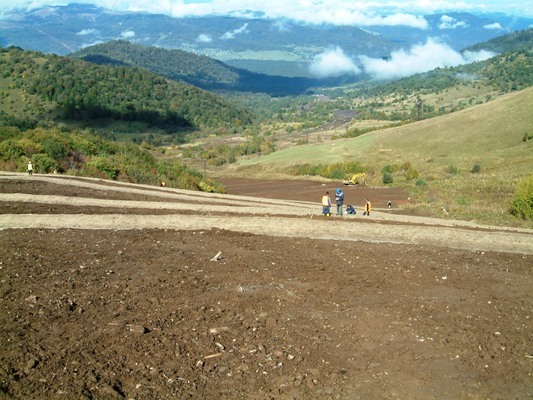 This operation involves levelling the ROW and constructing a running track and may involve considerable benching (levelling by cutting into one side of the ROW and building the other side), where side slopes are encountered. 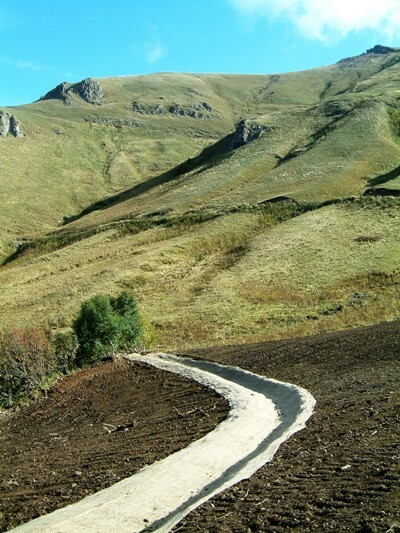 At this stage grips or diverter berms should be installed where required on all slopes, to maintain the ROW in a dry condition and prevent erosion and silt runoff. 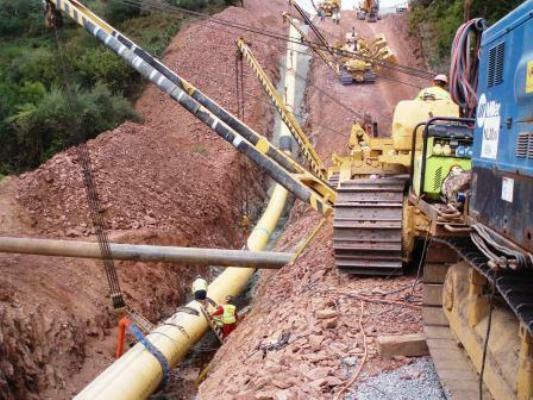 Such facilities are necessary to temporarily store the lengths of pipe as they are imported to the country or region of the project. Large areas are required and they have their own environmental and social issues. 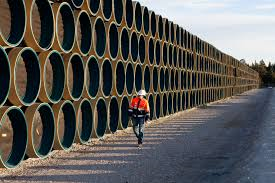 This operation involves stringing out the sections of pipe prior to welding. 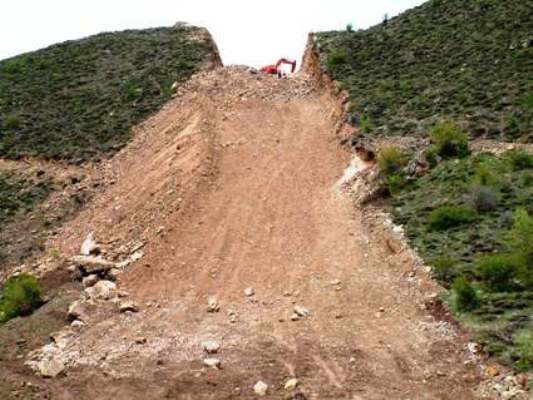 From an environmental perspective, stringing has limited effect, but can damage erosion berms, combined with the usual issues of machine access, accidents and spillages. 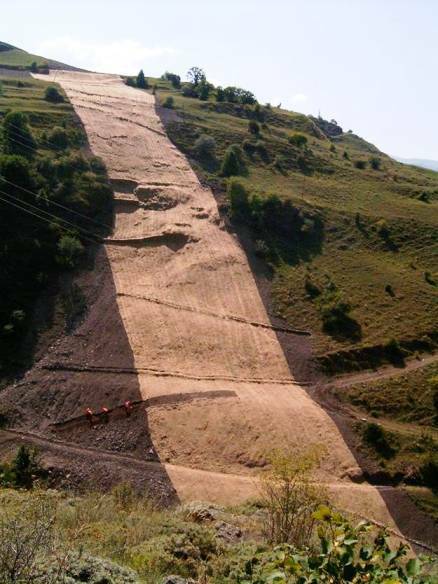 In very steep areas stringing may have to be done using an overhead cable system, as these photos in the Caucasus show. Field repairs to coating have little environmental impact, and are mainly associated with litter, as pots are often left on the spread after crews have been through. The facing machine prepares the pipe for welding and the sharp shards of metal (swarf) can become an environmental and safety hazard if not managed properly. In this photo the swarf has been retained in an end cap, but on some projects it can be left on the ground, representing a hazard. 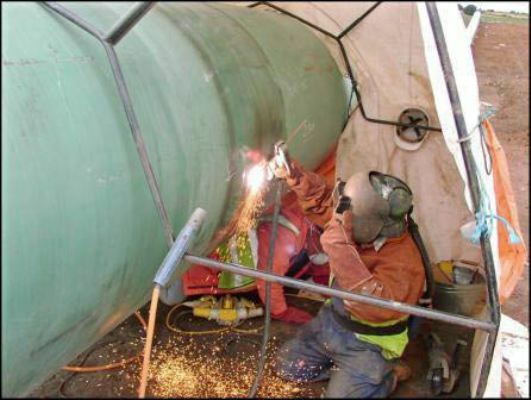 This involves welding the pipe sections together into mainline sections and fabrication (fab) sections, including bores, drills and other techniques for trenchless crossings of roads, rivers and other obstacles. Welding operations themselves should not entail much environmental damage, but in practice issues include garbage, welding debris, spillages and other construction issues. One of the operations that can result in often unforeseen adverse environmental effects is the tie-in. 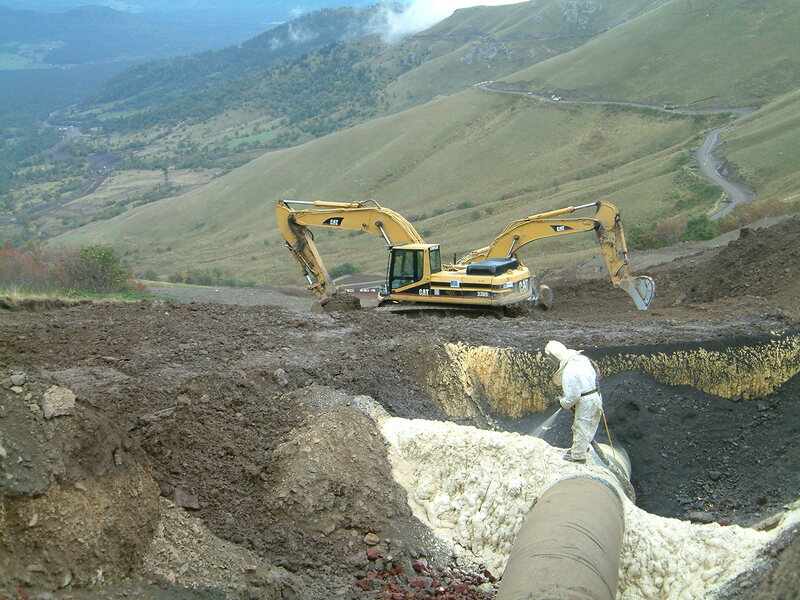 Tie-ins are often located in difficult terrain, such as the bottom of steep slopes and of course following hydrotesting. 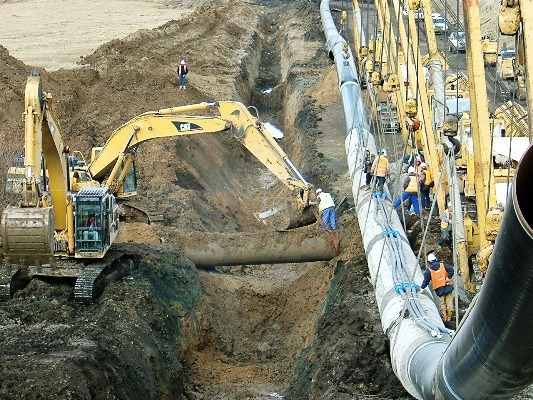 Some of the typical problems include poor control of dewatering operations and other poor practice, frequently made worse by tie-in crews operating largely independently of main line operations. 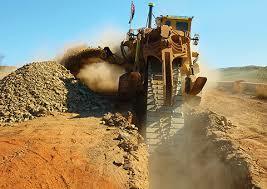 The machines and techniques will vary according to the subsoil type, topography and other factors and is conducted by back hoes or trenching machines, accompanied by pecking for rocky ground or blasting in solid rock. 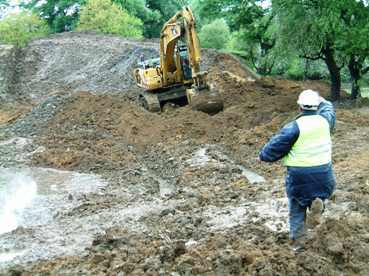 Environmental issues include water crossings and the excavation and storage of trench spoil and implications for surface water pollution and its containment on the ROW. In rocky ground the trench sometimes requires to be blasted by charges dropped into pre-drilled holes, prior to excavation by back hoe. Here a drilling rig is drilling the holes for the charges to be inserted. Environmental issues include fracturing rock and affecting underground springs, as well as noise and disturbance to any sensitive receptors, including local populations or dwellings. 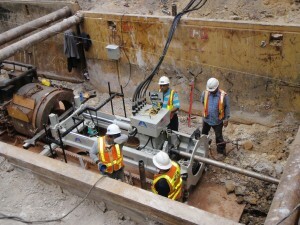 There are a variety of trenchless techniques, including boring/jacking, auger bore, HDD (horizontal directional drilling) and micro-tunnelling. 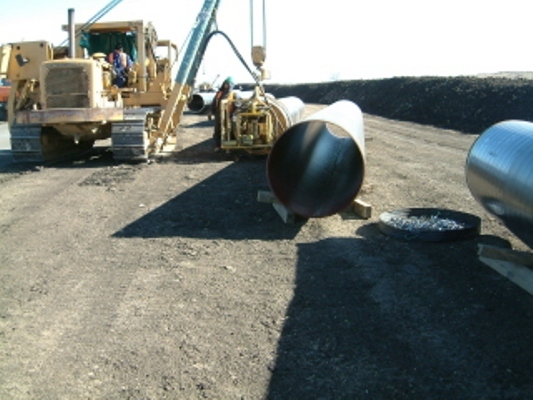 Each technique is designed to install the pipe without an open-cut trench and is used to cross roads, rivers, 3rd party service installations etc. 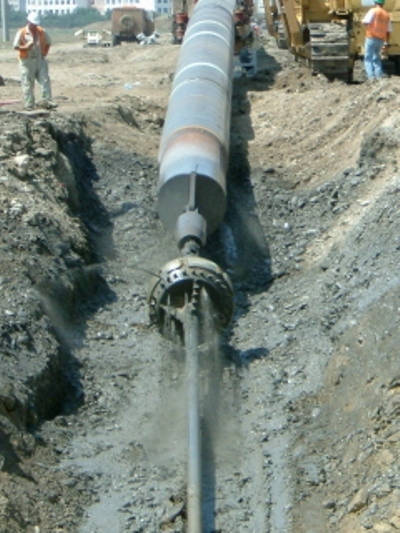 Several factors determine the trenchless technique, including distance and ground conditions. Each method has inherent environmental risks and mitigation mechanisms. 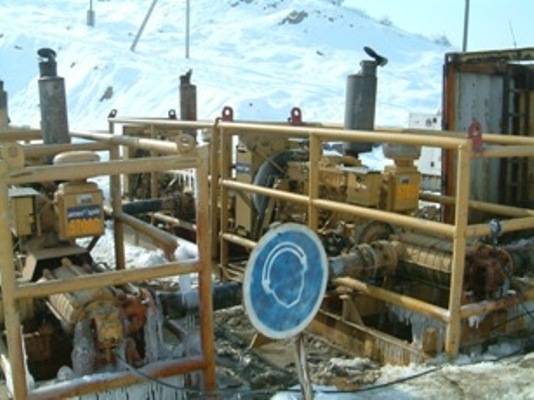 Those methods that utilise ‘wet’ drilling or mining often involve the use of drilling muds such as bentonite, which whilst benign, can lead to significant environmental risk if the material enters water courses or surface water features. 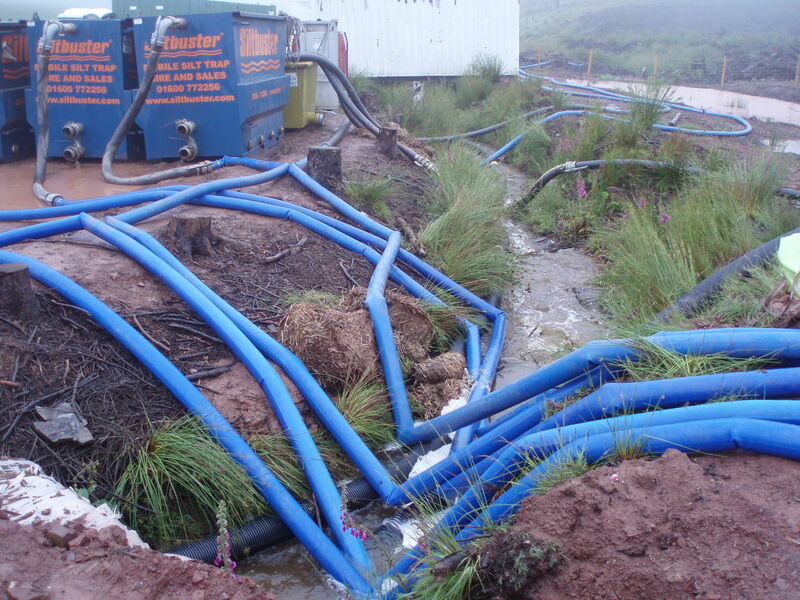 Environmental issues typically centre around the management of production water and drilling mud control. HEL has considerable experience of many drilling techniques and the management of the environmental risks, from the design and management of lagoons to incident response to breakouts etc. 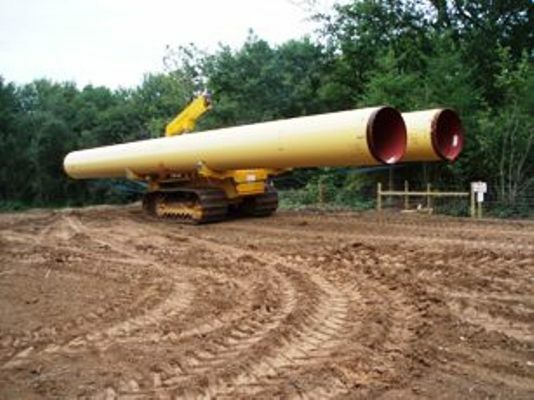 Lowering or ditching of the pipe can be a complicated operation, as it covers lowering in dry, flat ground to the crossing of ditches and rivers. 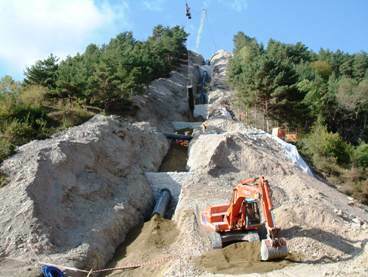 There are many techniques for river crossing, such as dam and overpump, wet crossing per se and swinging flume pipes carrying the river temporarily, before replacing them immediately after lowering of the pipe into the trench. Not only is the subject of river crossing very complex (with a great many potential environmental effects), but it is also affected by the design of the crossing, ie the depth of the pipe under the watercourse and whether the pipe is concrete weight coated etc. 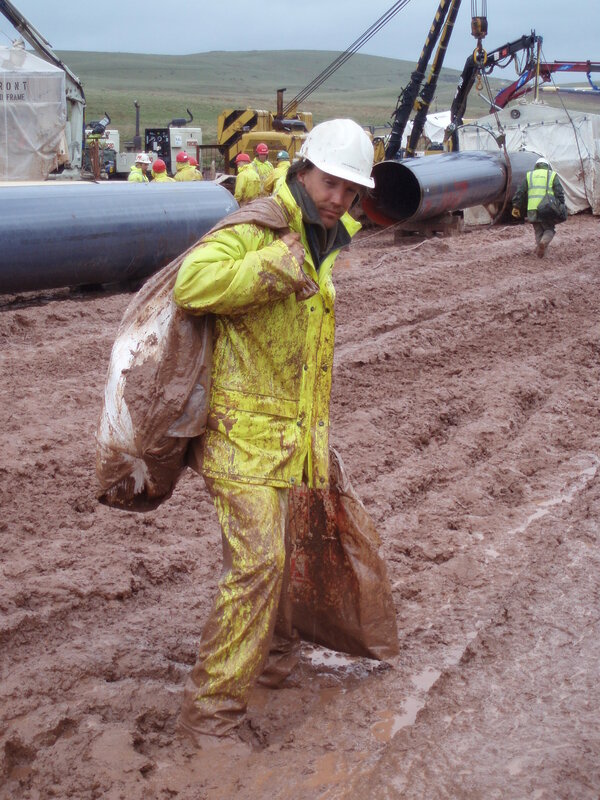 For more details email huckbody@huckbody.com/, as Andy has considerable experience of numerous water crossings both in the UK and overseas and can advise on mitigation. 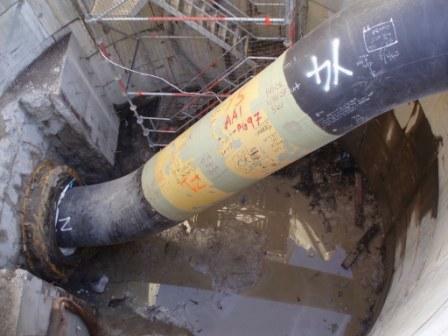 Lowering of a concrete coated pipe of some 400m in length, with a design of 4m cover from below the river bed. 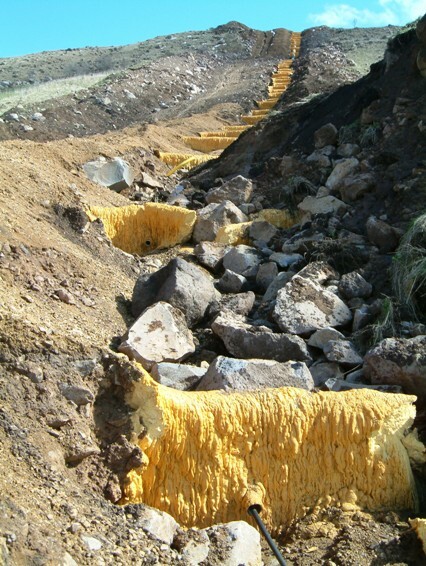 This installation has large environmental challenges, not least huge temporary disruption to the floodplain ecosystem, but also the need to deal with enormous quantities of turbid water. 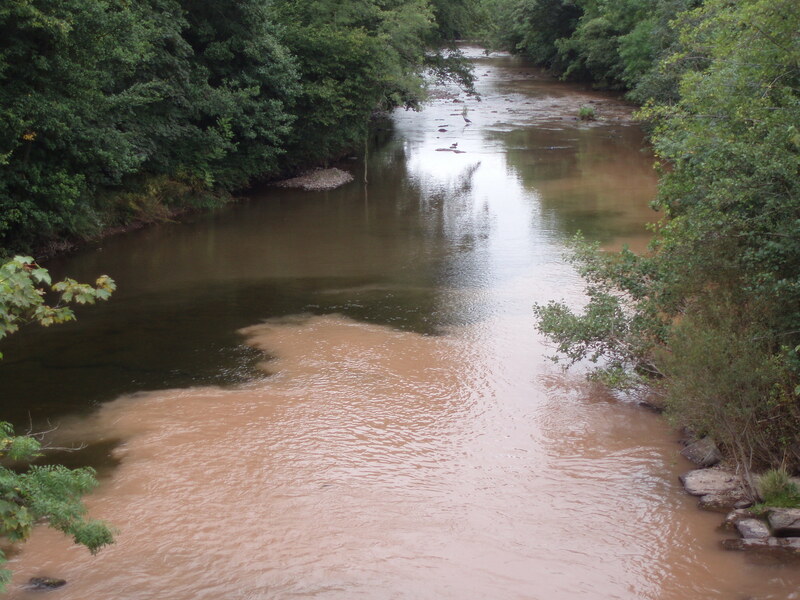 Bad practice associated with crossings such as this include taking extra working width and not effectively dealing with the turbid water, thus allowing silt to enter the river downstream. The river in the photo had been diverted for lowering operations, but an insufficient plug to reform the main channel inadvertently allowed the river to break out and flow down the open trench until the banks were hastily reformed. This lead to increased fish mortality as they became entrained in the trench and were duly pumped out onto the floodplain. 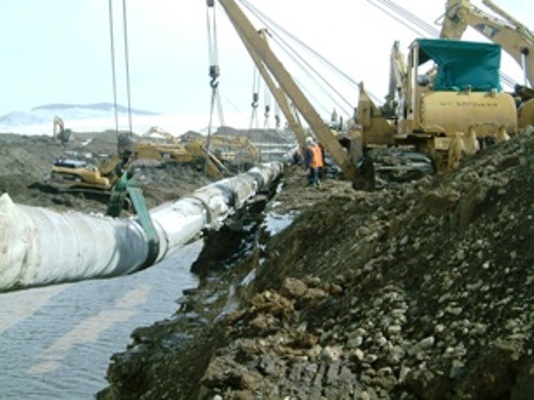 One of the most important elements of pipeline construction relates to effective water control and the need to prevent pollution of watercourses. 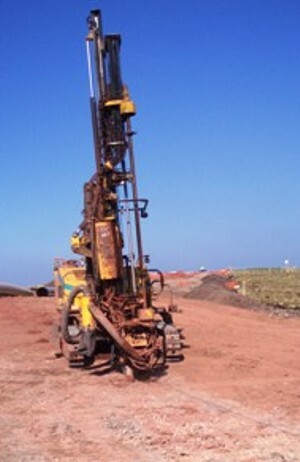 It is common that many excavations (trench, tie-ins, shafts etc) will encounter water which will need to be pumped out. 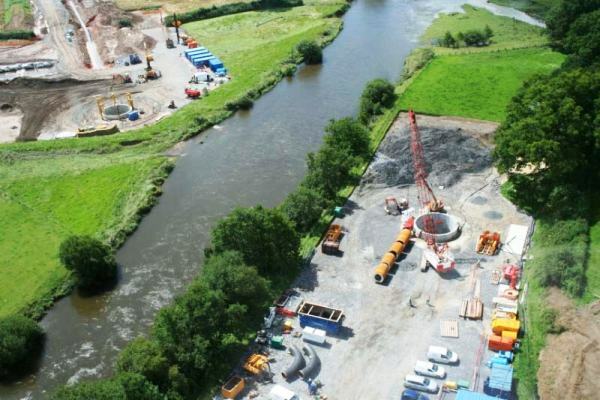 It is essential to construct dewatering facilities that settle sediment and prevent it from being transferred to watercourses, as well as prevent unnecessary sediment pollution of adjacent land. 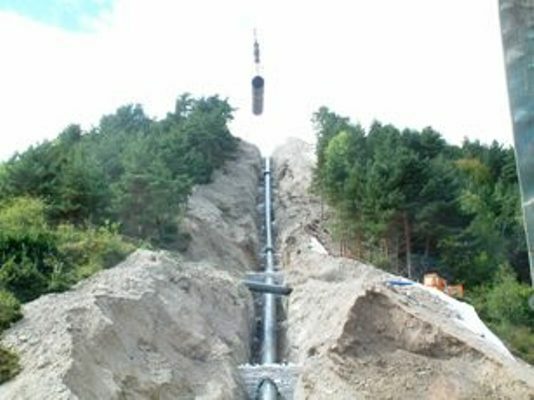 There are many trenchless techniques, including boring, HDD and tunneling, of which the latter two can generate large quantities of turbid water (often containing bentonite drilling mud). 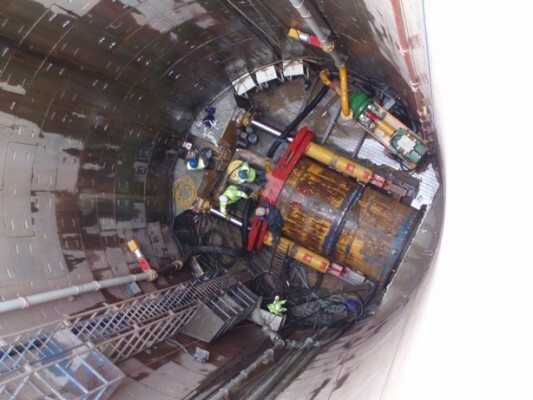 In theory, many of the tunneling techniques have a closed recycling of drilling mud/water. But contractors often mine at rates higher than the design, necessitating considerable dirty water management. A variety of methods can be applied to such waters, including settling in constructed lagoons, the use of silt traps, silt fences such as Hy-Tex Terrastop, silt retainers such as silt buster , or The Silt Machine and even electro-static precipitators (although these are usually cost-inefficient). HEL has a wealth of knowledge and experience in water management and can advise on many techniques and situations. 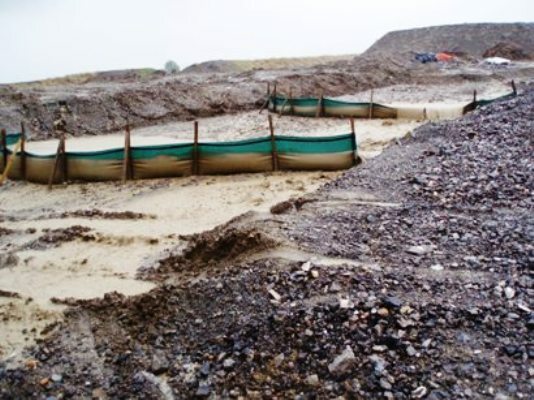 Silt fences are used to prevent erosion and watercourse contamination, by allowing water to pass through, whilst retaining the silt. 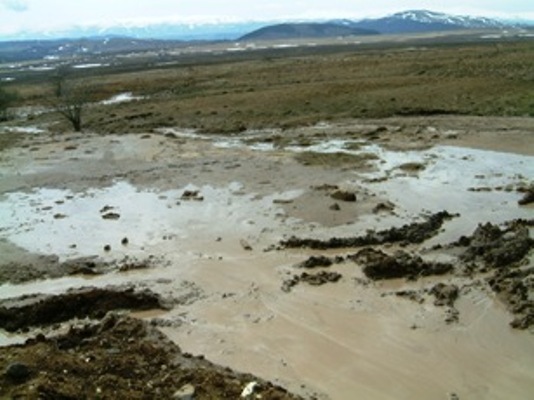 Sometimes, excessive rain during heavy storms can overwhelm pollution prevention measures, such as occurred here, where the silt fences were overtopped by a huge storm. Events like this emphasise the need for effective pre-construction drainage and frequent grips/diverter berms to prevent down-slope runoff. 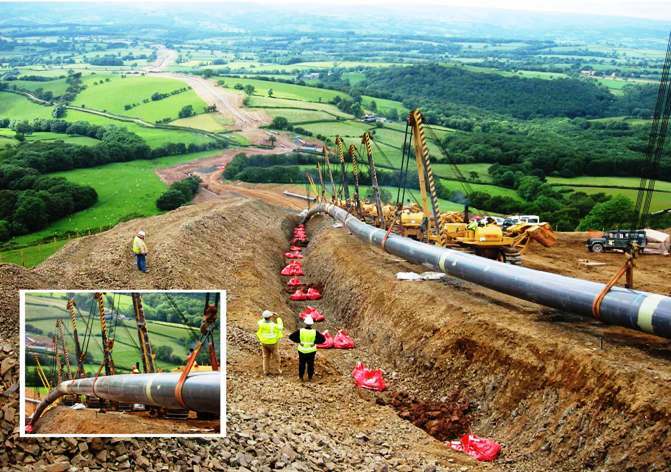 The vast majority of pipeline projects seek to minimise their environmental impact through robust procedures and on-site controls. However, occasionally mistakes are made or unforeseen events occur which lead to pollution incidents. The environmental effect and legal implications vary from country to country. 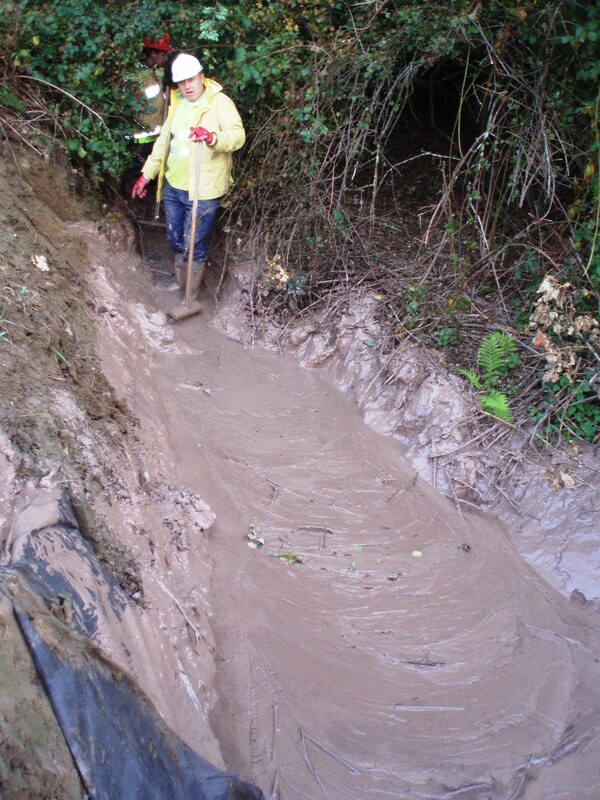 In the UK the Environment Agency (EA) are often involved in dealing with such incidents, especially when they affect sensitive watercourses and rivers. The EA can undertake enforcement action, which could result in a prosecution and/or financial penalty. This section gives some examples of pollution incidents, including bentonite spillage to rivers and silt pollution of valuable river habitat. 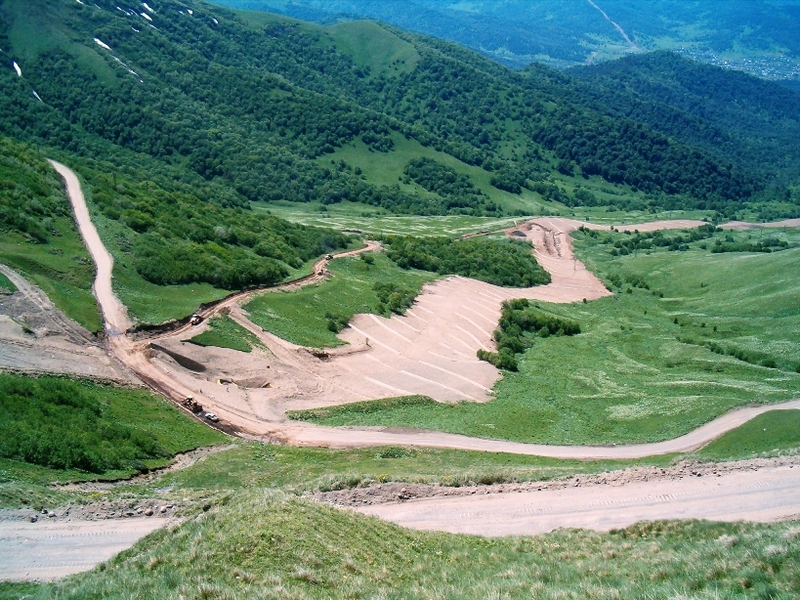 Environmental issues include placing material back to produce a suitable subsoil layer prior to topsoiling. 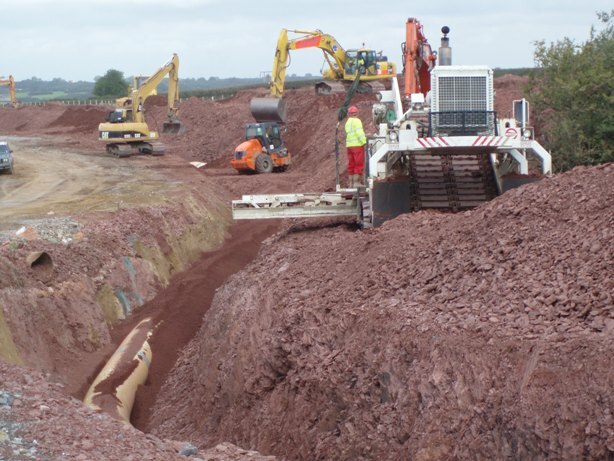 In rocky ground it is common practice to import considerable quantities of backfill material that meets the backfill specification and this can cause transport problems and running track maintenance issues. 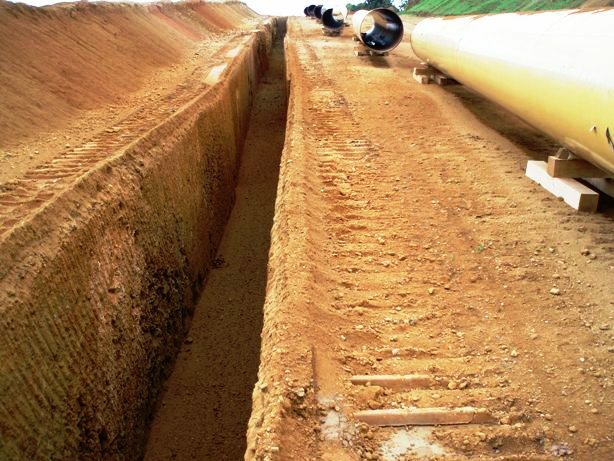 Backfill material is compacted typically in 300mm layers to prevent future settlement. The photo below shows a padding machine backfilling and the one below shows a back hoe mounted compacter in action. 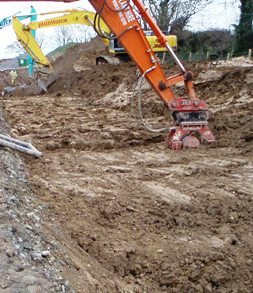 During the backfilling it is important to install water stops or trench breakers that prevent water washing down the porous trench material and causing subsidence. Breakers are also required to safeguard valuable wetland sites that otherwise would be drained by the trench. Breakers can be formed from imported clay, sand bags or expanding foam. Each of these materials and indeed the breaker strategy can have environmental impacts. This phase involves returning the ROW and all other work areas to as near pre-construction condition as feasible. Works include removing benching, subsoil grading and final topsoil replacement, soil management and post-construction drainage where required. 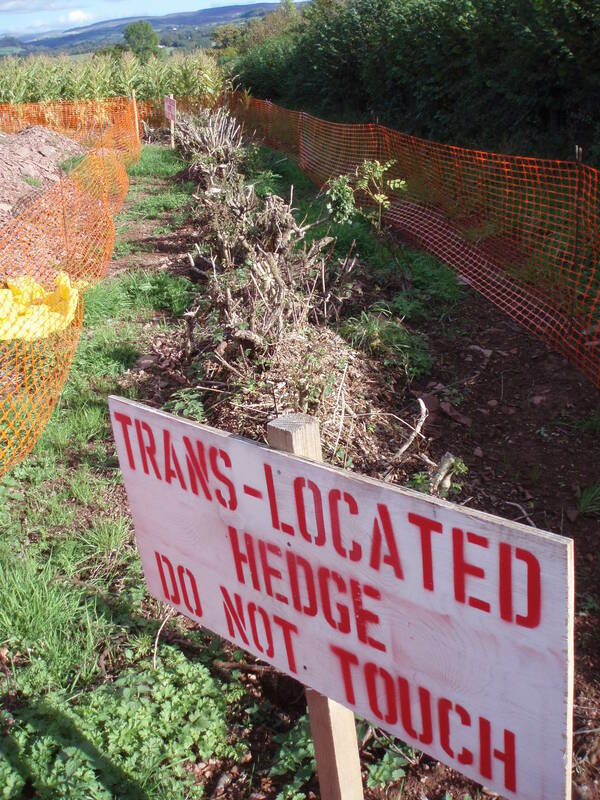 Following works include reinstatement of all hedgerows through planting and fencing to protect from livestockand rabbit grazing. 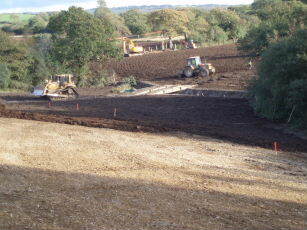 At this stage minor habitat works can be undertaken with landowner consent, such as this new pond below for habitat improvement as part of a countryside stewardship scheme. Close attention should be paid to drainage works to ensure inter alia that valuable wetland sites are not being drained and conversely, important farmland should not be left with damaged or impaired drainage. Whilst clients would not desire differential reinstatement standards, it is often the case that the standard of reinstatement on overseas projects can be lower than that in the UK. 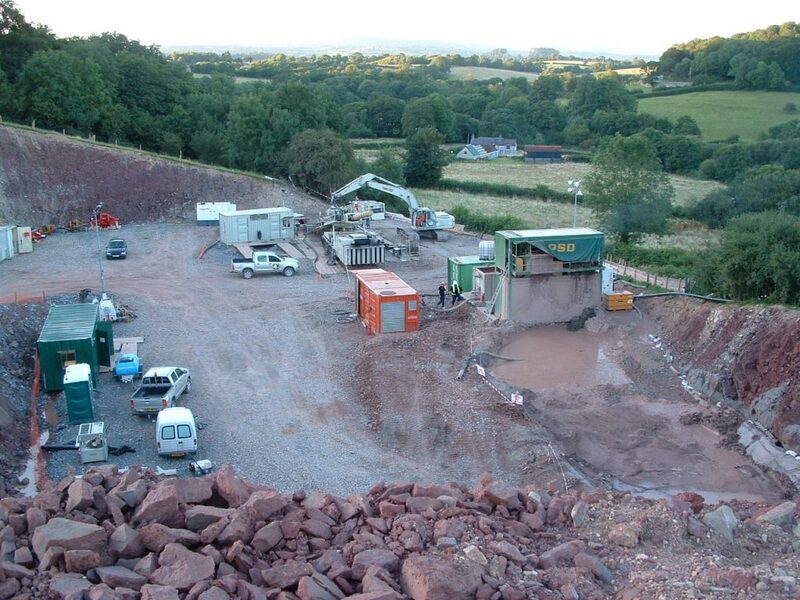 Examples of bad practice include poor decompaction/ripping, burial of rock in agricultural land and burial of construction waste/running track material and poor topsoil handling. The photo below shows trench rock buried in topsoil in an overseas project and the photo below shows a clay topsoil panned by inappropriate handling by heavy machinery. 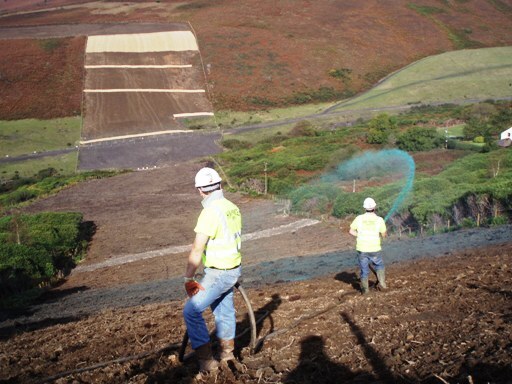 On steep slopes and/or where topsoils are prone to erosion it is advisable to apply biodegradeable jute matting to them, through which vegetation will grow to form a stabilised finished surface. Even through agricultural areas it is important to understand the soil type, to ensure topsoil does not erode and cause runnels; the photo to the left shows topsoil erosion and deposition of soil against the field boundary due to insufficient stabilisation following topsoil replacement. On some very steep landscapes, which will not be cultivated, it is sometimes prudent to install permanent erosion berms across the ROW. 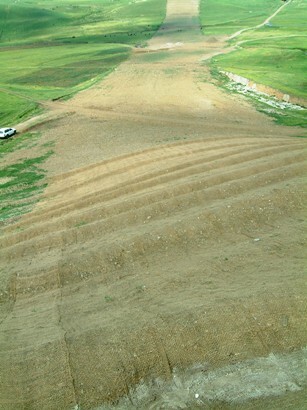 An example of this on a 4km long slope that was supervised by Andy is shown here. 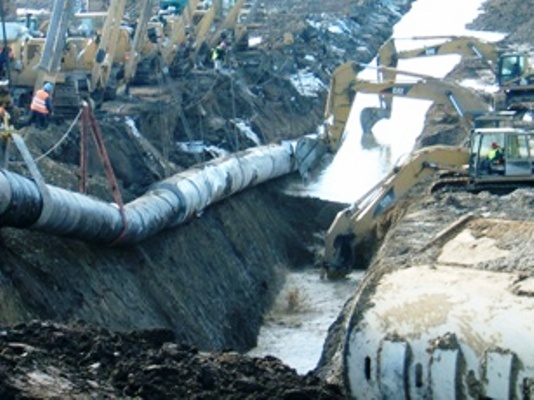 Post construction drainage is designed to ensure that the pre-construction drainage features are fully restored and to some extent counteract any inadvertent compaction and reduction in drainage efficiency. 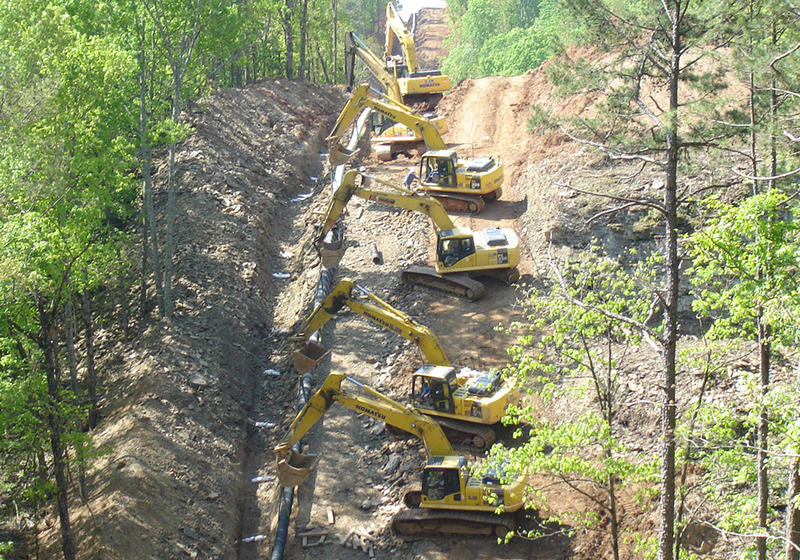 They also play a role in reducing lateral drainage entering the trench, thereby protecting the backfill, particularly when trench breakers/water stops are limited down slopes. 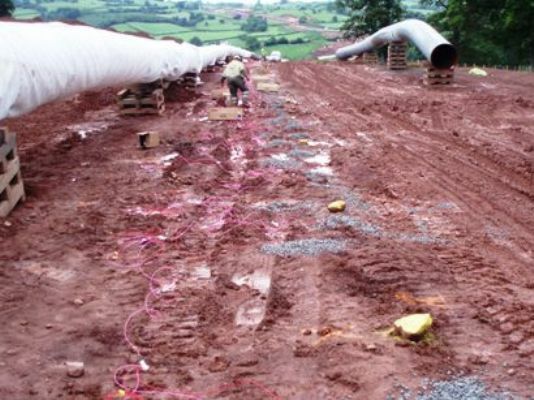 In principle the post con drains should have little environmental effects, but UK schemes can sometimes have somewhat of an over-zealous approach to post con drainage, resulting in a net drainage of the pipeline corridor compared to the pre-construction condition. Temporary environmental effects can be associated with any time delays in final reinstatement following drain installation. 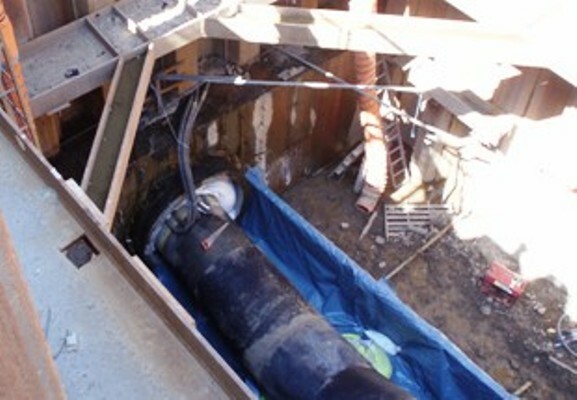 In overseas projects which lack formalised drainage features, post con drainage is often limited to reinstatement of any temporary cut-off drains and routing of drains from each of the trench breakers. 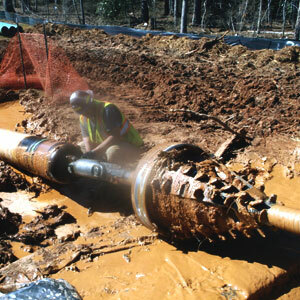 Hydro-static testing or hydrotesting is designed as the last test of the integrity of the pipeline to pressures, above the designed/product capacity. It basically involves filling sections of the line in sequence before pressurising the water for a soak period, before discharging the water or passing it further along the line. Environmental issues involve sourcing of the water resources and controlling the discharge. In lined (gas) pipes the water tends to be ‘as original’, whereas in unlined (oil) pipes additives may be required, depending on the quality of the water. For example oxygen scavengers are often applied and where source waters are contaminated with sewage or organic effluents (eg in some developing countries with poor or defunct wastewater treatment facilities) biocides are necessary. Such additives require specific environmental mitigation through neutralisation and aeration to avoid damage to the receiving waters. 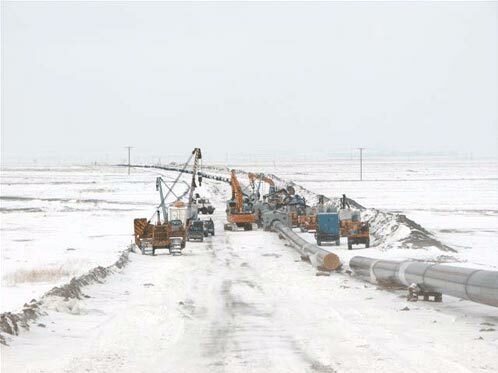 H&S is a pre-requisite to any successful Project and for pipelines it is a crucial issue, not least because pipeline construction involves many aspects of construction including earth moving, excavations, lifting operations, welding, confined spaces and so on. 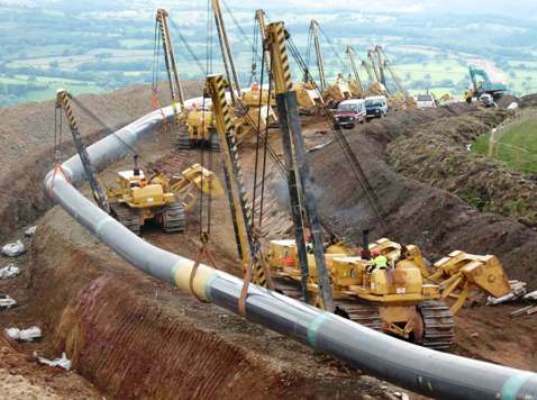 Huckbody Environmental has carried out numerous H&S inspections and audits of construction activities over many years, including more than 8 year’s experience of on-site pipeline construction, as well as for other projects such as highways and bridges. 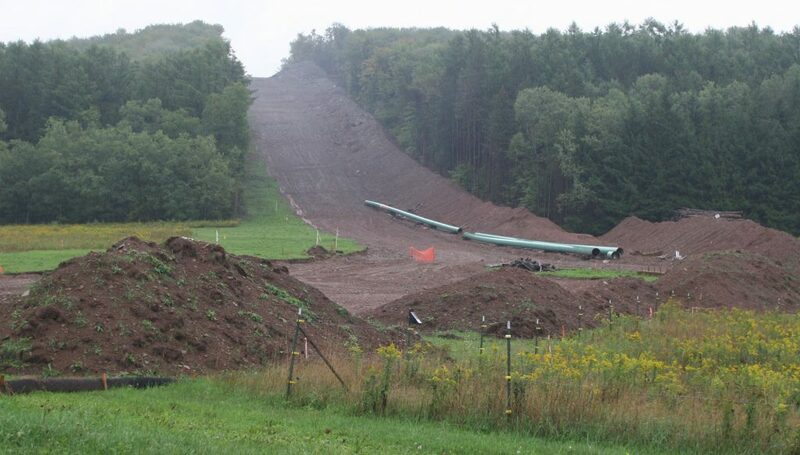 The construction of pipelines and supporting infrastructure such as compressor stations, pump stations and above ground check and valve installations does create the potential to impact people, communities and society to some extent. This brief section of the guide does not attempt to present or cover these aspects in any detail whatsoever; readers are referred to the relevant sections of published pipeline ESIAs. 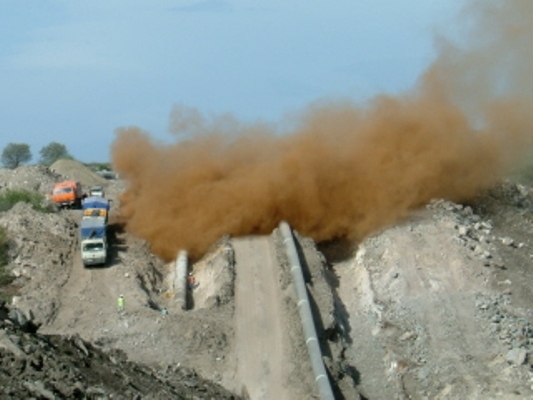 Typical social effects are associated with: temporary and permanent land acquisition or land access; disturbance and disruption to agricultural practices and other land uses during construction; and characteristic noise, nuisance and disturbance associated with large-scale construction activities involving numerous large plant and equipment. 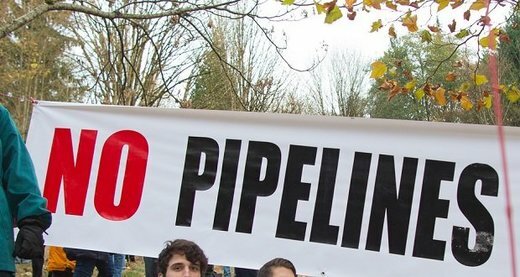 From time to time protests do occur on pipeline construction projects; Huckbody Environmental has extensive experience of on-site protesting; involving anything from day visitors to protestors living and camping on the pipeline route in woodlands and in disputed land ownership claims. Given the strategic objective of reinstating to pre-construction conditions wherever possible, in general, the majority of impacts are of short term duration. 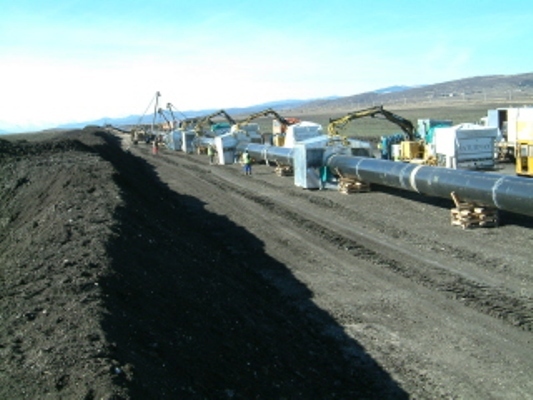 Exceptions occur for permanent infrastructure such as stations and the like, safety zones and restrictions for practices and developments above the buried pipe. 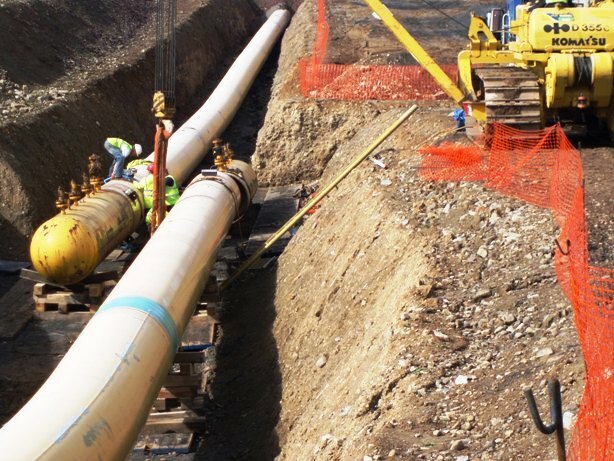 From an international financing perspective, pipelines can trigger involuntary resettlement policies as incomes and access to resources can be affected. Beyond the standard compensation practices, this requires compliance to such resettlement policies and standards, such as provision of livelihood restoration or income-generating initiatives. 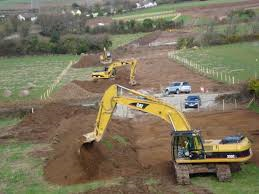 The Land Easement and Access (LEA) procedures by the project proponent also require to be undertaken to the appropriate standard and then both LEA staff and CLOs should be available throughout construction for effective community liaison and treatment of grievances. In addition, most projects take the opportunity to undertake some community development initiatives, often in line with CSR aspirations and objectives. 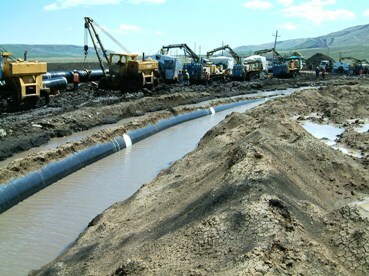 Increasingly popular over the last 10 years plus, the management of Environmental and Social aspects of pipeline construction and operations is organised through an Environmental and Social Management System, sometimes in accordance with (or more likely aspiring to ISO 14001; given the typical model of a pipeline company being an agglomeration of investors, often without conformance to one corporate standard). This has been associated with a burgeoning of this field of work for environmental consulting. 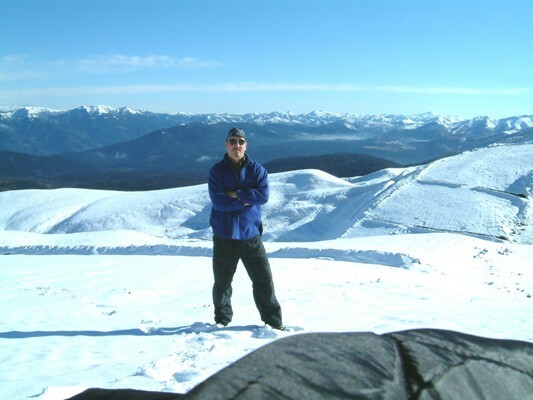 Huckbody Environmental has extensive experience in the field of ESMS Management and the Director Andy Huckbody stands out in this regard as he has both environmental and social field experience, as opposed to many consultants who present themselves as ESMS experts, whilst having little or no experience of social management. Andy’s experience includes management of teams of Community Liaison Officers (CLOs) during pipeline construction, infrastructure installation and large scale mining projects, as well as many years experience in social and community development and involuntary resettlement. It has been shown to be essential for such ESMS managers to have on-site practical experience if they are to manage effectively the E & S and Cultural Heritage aspects. These skills are very different from those obtained by a typical environmental or social consultant working in ESIA, as practical knowledge is invaluable during construction. In some respects this is a weakness in the environmental/engineering consulting sector, which typically sees a consultant engaged for an ESIA and then the commission terminates, preventing most consultants from experiencing what really happens in large-scale construction. 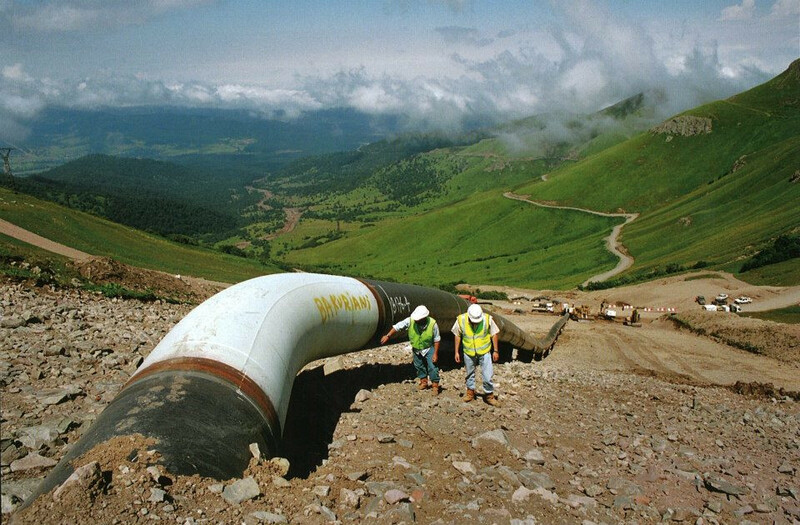 A less well known but interesting phenomena occurs when pipeline companies outsource ESMS management, believing that they are securing corporate experience from the consulting company. In many cases, consulting companies in effect ‘body shop’ a range of individual consultants for the project duration, as the consulting company does not typically employ such staff, as they can earn considerably more income as an independent consultant.